I recently had the pleasure of seeing Paddington 2 with my daughter at Warner Bros, and we both absolutely loved it! I thought it was one of the best family films I had seen in recent years. Now that Paddington 2 is out in theatres, I thought it would be fun to make a Paddington food art breakfast to celebrate! Inspired by Paddington Bear’s favorite food ever, I created an orange marmalade sandwich topped with raspberries, blueberries, and strawberries. Peel your orange and place orange slices in a blender until pureed. Place orange puree, water, and honey in a small pot, and bring to high heat. Once bubbling, place heat on low and let simmer for about 15 minutes, stirring ocassionally. Once thick, remove from heat. Once cooled off a bit, place in a jar and refrigerate overnight. To enjoy your Paddington food art breakfasts, cut your slices of whole grain bread into a slight oval shape, sandwiching orange marmalade in between your slices. Place it on a plate, and place a couple rows of blueberries under your sandwich to represent Paddington’s jacket. 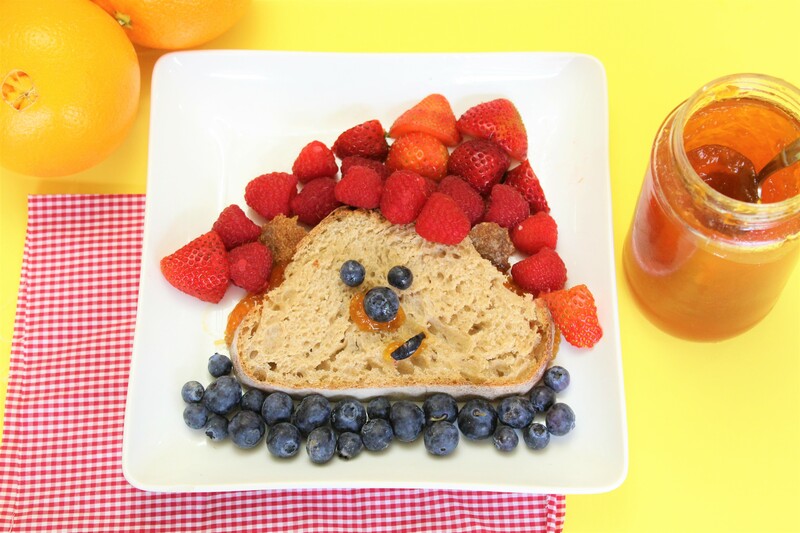 Use small amounts of marmalade to “glue” blueberries on Paddington’s face for his eyes, nose, and mouth. Cut two small pieces of your bread crust for Paddington’s ears. Scatter raspberries and strawberries to form Paddington’s hat.